What was used in the Making of Mourning Jewellery? Mourning Jewellery is one of the prominent features of the Georgian period in which messages were hidden inside the design which can be deciphered if the observer has good knowledge and keen interest. Many of the oldest forms of great jewelry type were found out in the burial grounds and the graved of the dead person. 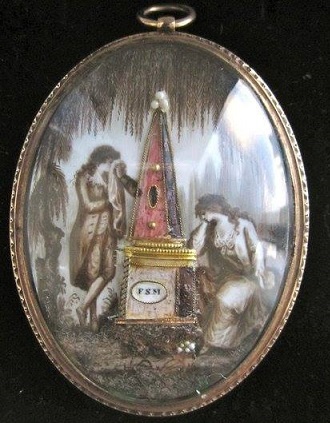 Lenore Dailey, the dealer of the antique mourning jewelry states that during the Georgian period “Momento Mori” which is a phrase whose meaning is “Remember that you will die” was largely followed by all. Momento Mori jewelry was worn to remind the person who wears that he would also die a day and life is very short and fading. He observed that there were many deaths during that time mainly because of disease. Many mothers lost their child death was something that was always on their minds that when it will take their dear ones. When King Charles I of England was executed around 1649, it began the change in the mourning jewelry. Many royal persons wanted to sympathize with the king and hence they appointed their jewelers to make jewel pieces that comprised of the faced Stuart crystal with the portrait of their king beneath it. With this, the trend began to have mourning pieces for the remembrance of the lost and loved people amongst the wealthy upper class. This changed the people’s perception to change from momento mori jewelry which marked the mortality and transient life on the earth to the mourning jewelry which symbolized to remember the loved ones, despair, comfort, and sympathy in their absence. Usually Mourning jewelry pieces were cast out of gold along with silver and other base metals, and rock crystals. Hardly diamonds were used. 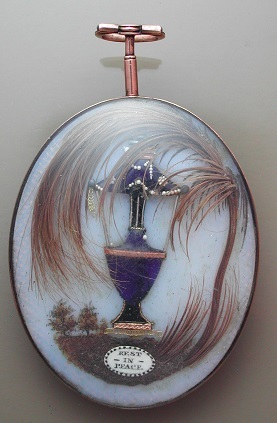 The Scenes that were included in the jewelry were painted on copper, ivory, vellum which is made from animal skin. Often they used human hair as design part to paint scenes. 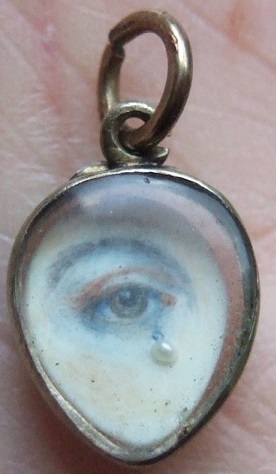 In the Georgian era, eye portraits, Neoclassical statements, the heart symbols, and love statements were engraved and built for the remembrance of loved ones. Some of the examples of jewelry that depicts the mourning and sentimental of the Georgian period along with discovering their fashion and culture are shown. 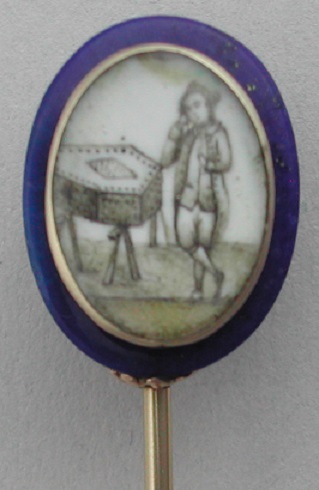 In this pendant, a combination of fashion and mourning is seen, which was made in 1787 for a child. The child Francoise Martin of age 11 years was the daughter of Francois Martin and Marie Susanne who died in the arms of their parents. Here elements of pure Georgian mourning are represented of which willow and urn are detailed to its finest level. The pearl here represents the access of the Orient during that period. 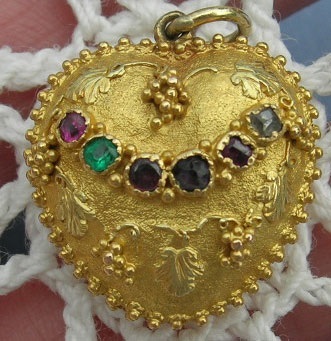 The pendant shows that many varieties of material were used during the Georgian Era. Black was popularly used in mourning jewel and in clothing. However many started using white enamel as its use in jewelry for young and unmarried people. Then the trend began to use white in mourning jewelry and hence evolved such white enamel rings and other jewelry. 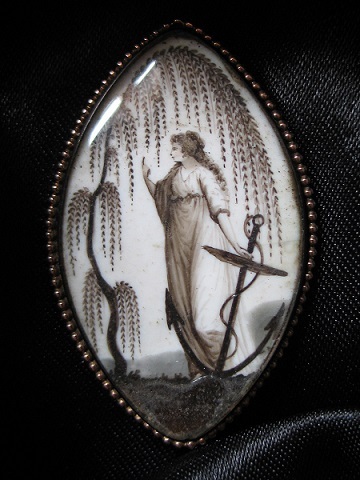 Mostly female were crafted for the mourning jewelry which represents something personal or metamorphic with the wearer. But crafting a male is a representation of very personal as it was very exceptional during that time. Here a gentleman is painted with the sepia painting which is crafted on stickpin and rings. Here a female mourner who is balanced by a willow is depicted pointing towards the heaven showing a perfect balance between faith, charity, and hope. A grand story is represented here in a very small piece of jewelry. It is the symbol of eternal love which is still present today. When someone gives this heart to another, it symbolizes true love that was developed in the 18th century. This heart captures the maleficent example of the great form of style. 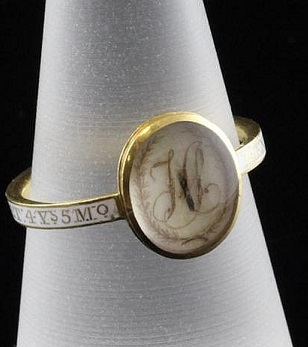 This type of jewelry has its connection with the reign of George IV. The young Prince of Wales wanted to marry a widow Maria and he gifted her this type of Georgian Eye which held her eyes and all found this as a new concept to symbolize young love. However, this jewelry than later used for mourning with minor changes like a teardrop from the eyes or with black enamel or with a turned down eye.